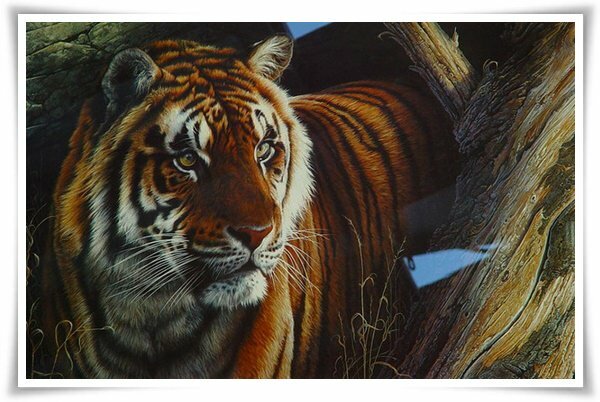 The largest cat species in the world, the tiger is also unarguably among the most visually stunning creatures that walk our planet. 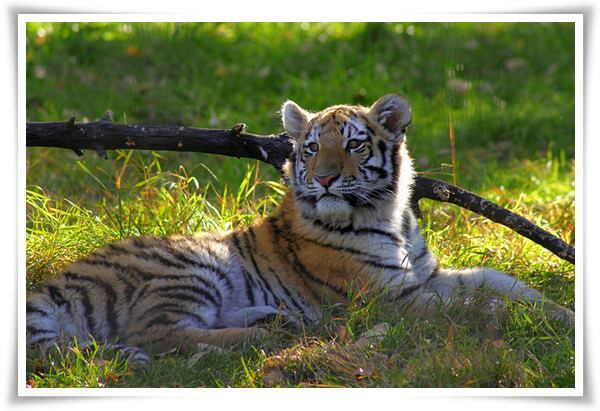 Because they reside in the wild in areas that aren’t exactly popular when it comes to human habitation, such as tropical forests and wide grasslands, most of us will never have the opportunity to see one of these beautiful creatures in person with our own two eyes, unless we view them in the captivity of a zoo or nature preserve. Thankfully, there are countless photographers out there who are willing to comb rugged landscapes in order to capture incredible photographs of all types of tigers. 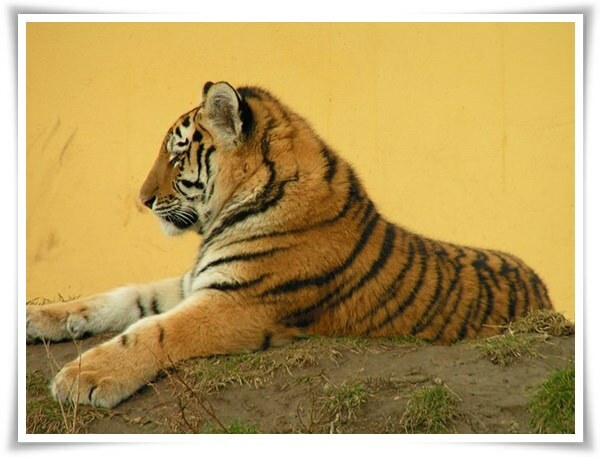 Especially because each subspecies of tiger that is left on the globe has an endangered status (Three subspecies are already extinct! 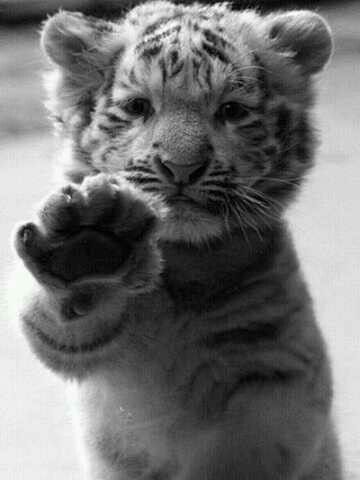 ), these photos are especially precious because future generations may only know of these cats as a thing of the past. 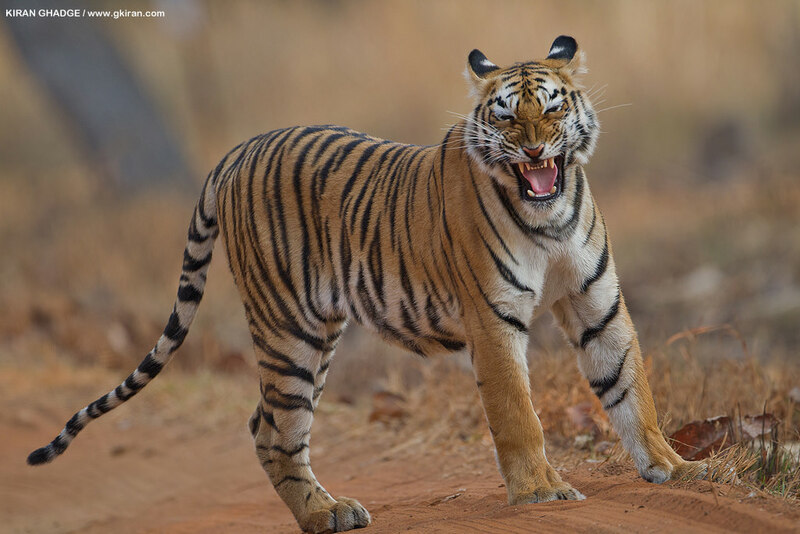 Hopefully through incredible photos like these and increased awareness, the awesome tiger will be present in the animal kingdom for many years to come. 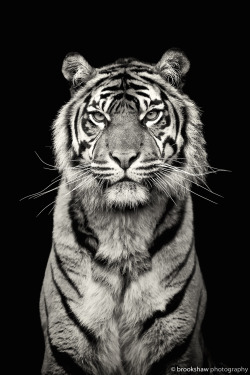 We hope that these portraits will not only be entertaining and fun for you to view, but that they will also inspire you to fight for the preservation of this majestic animal. 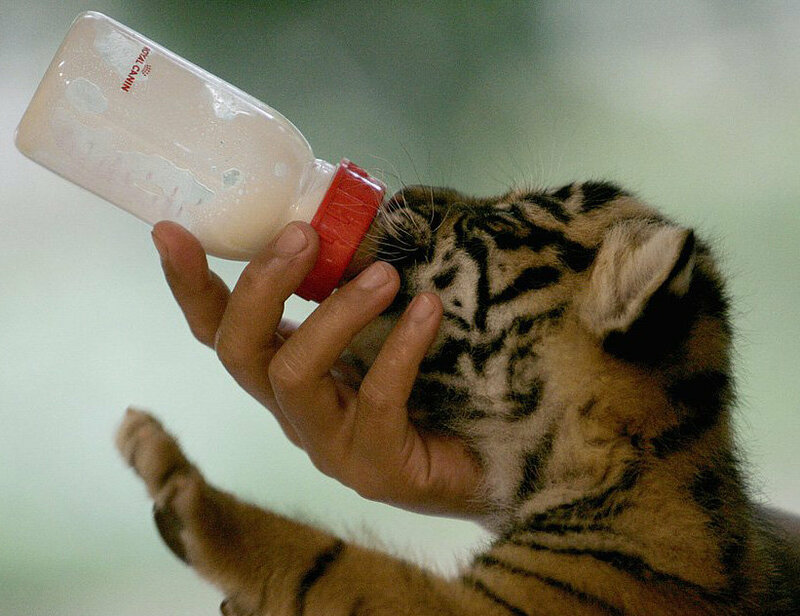 Although they are widely feared for their aggressive temperaments, even tigers start out as babies that need lots of help with basic tasks like feeding. 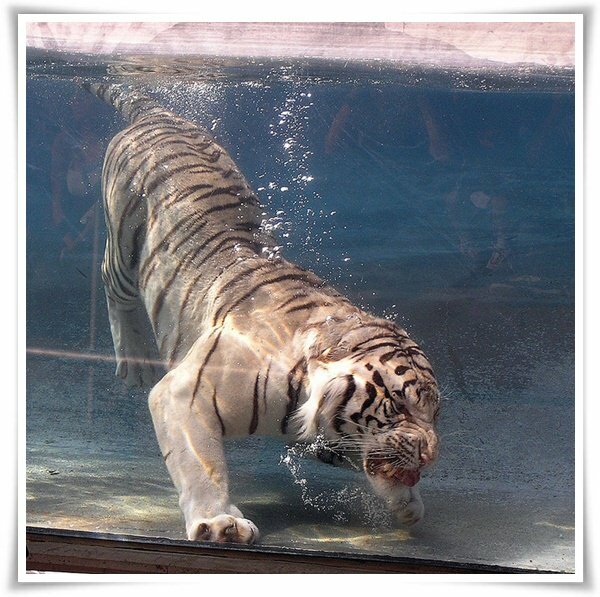 While tigers are notorious for their ability to tear apart anything that’s placed in front of them, they are not the terrifying creatures by nature that pop culture has characterized them to be. 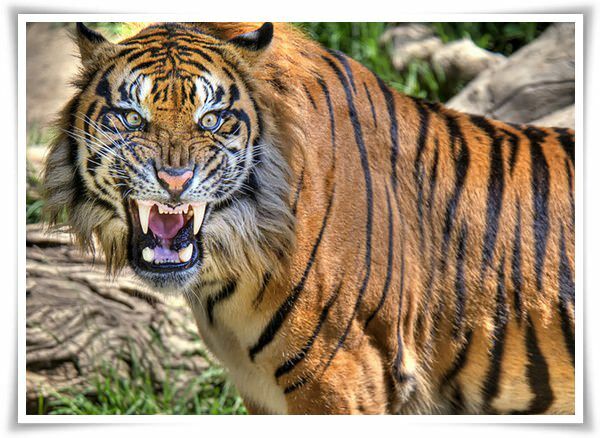 In reality, most tiger attacks are instigated by humans that are either destroying their natural habitats, or interrupting the solitude that they naturally crave. 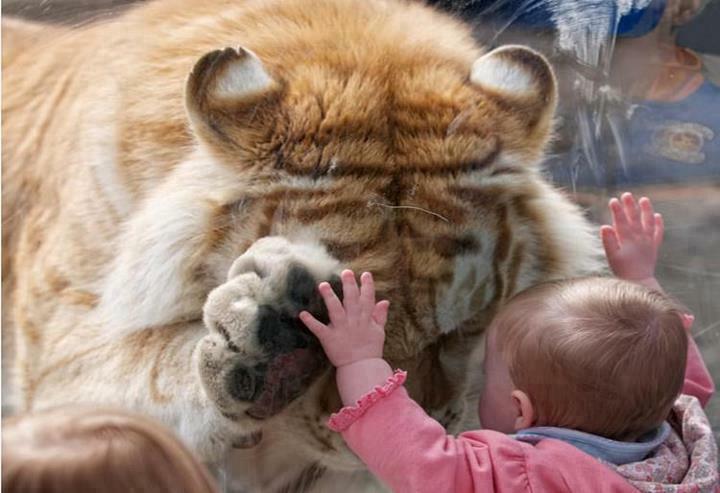 This beautiful photo captures a gentle moment of bonding between a young human child and a Bengal tiger in a zoo, revealing that these animals aren’t always a danger to mankind. 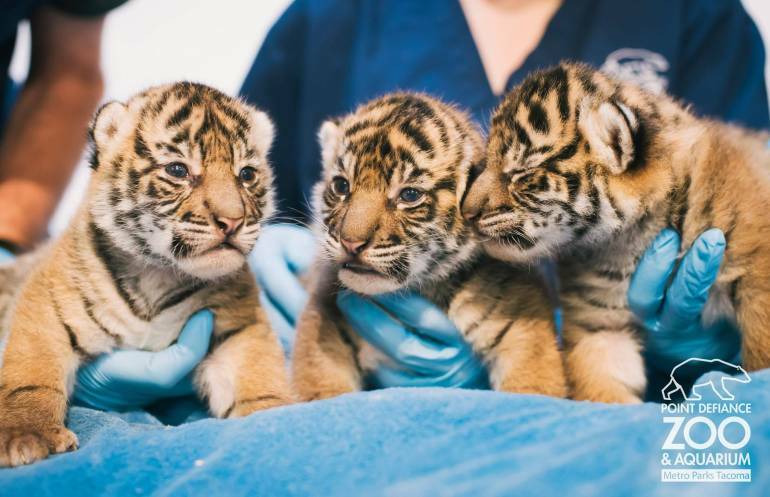 If you think human babies are cute, prepare to be blown out of the water by these baby Sumatran tiger triplets, who are also three times as adorable as any human child we have ever seen! 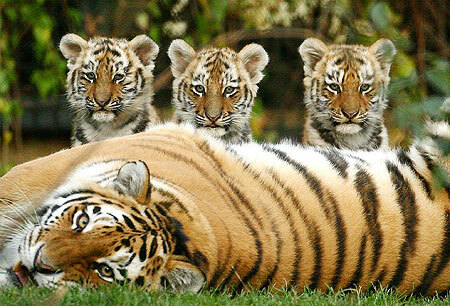 With their mama, these little sweeties reside at Point Defiance Zoo in the Asian Forest Sanctuary. This incredible shot not only captures a tiger in his natural habitat, but it also seems to have caught an eerily human-like smile on this creature’s mug! Just like their human counterparts, animals have to seek ways to keep cool in the blistering summer heat. 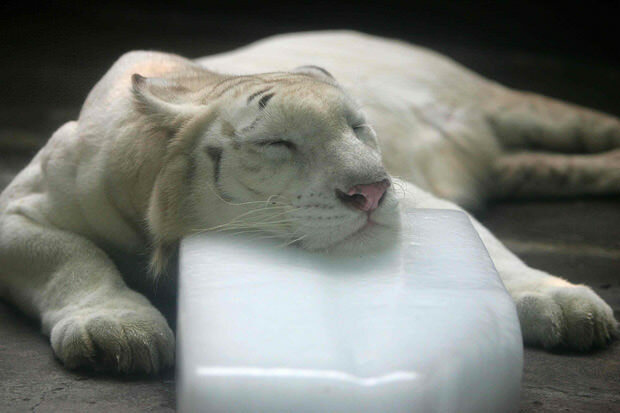 This stunning white Bengal tiger uses a large slab of ice to beat the heat at China’s Chengdu Zoo. 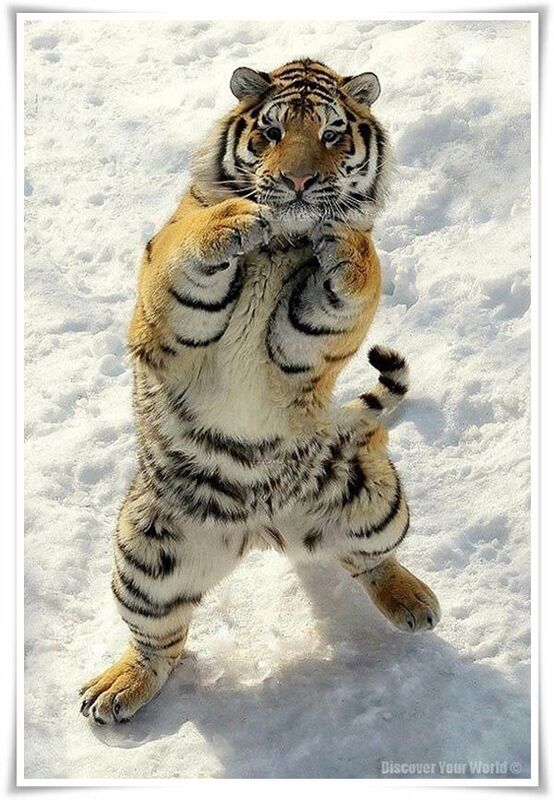 Nothing can stand between a tiger and his meal. 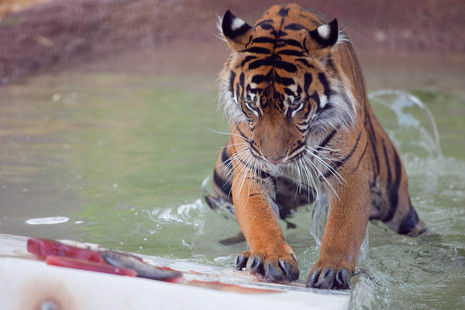 A tiger plows through a shallow pool in order to get his hands on his dinner, a slab of juicy raw meat, at the Phoenix Zoo. Newborn photography doesn’t just bring a tear to the eye of the beholder when it’s capturing humans. 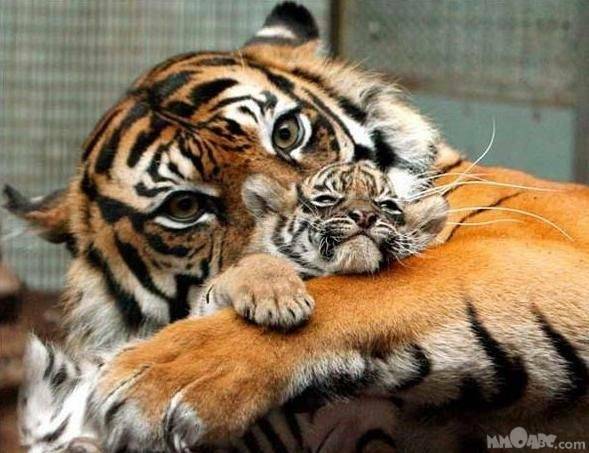 The bond between the tiger mama and her cub is captured so well in this precious portrait that it’s almost tangible for those who view it. 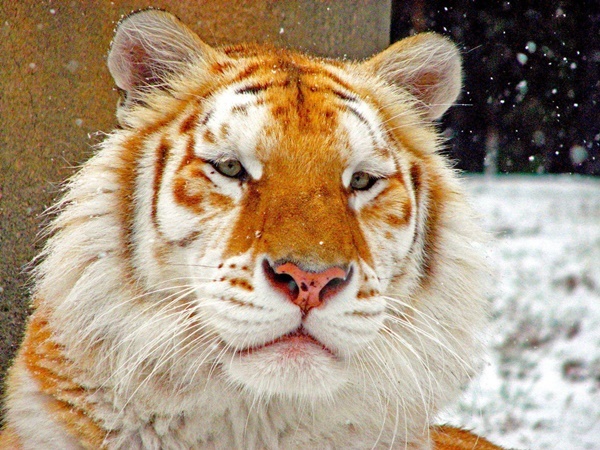 When most people think of tigers, the image of a large orange cat with black and white stripes immediately comes to mind. 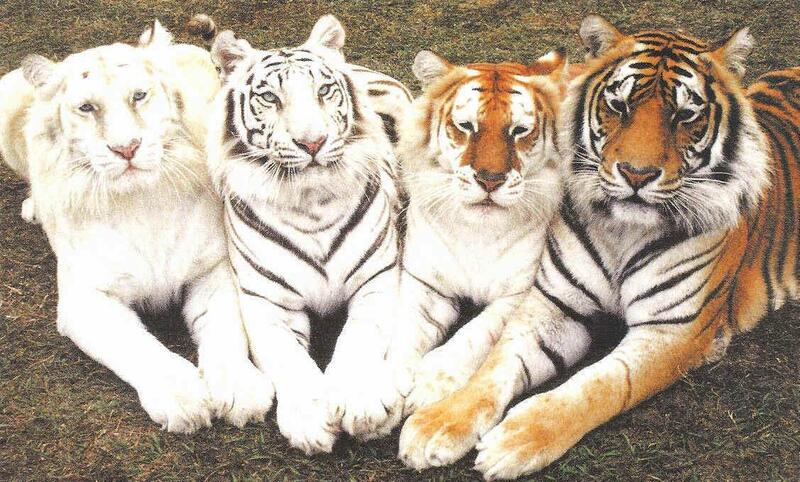 This gorgeous photo of four tiger subspecies with disparately different appearances shows that there is more diversity to this precious creature than many of us may have thought. 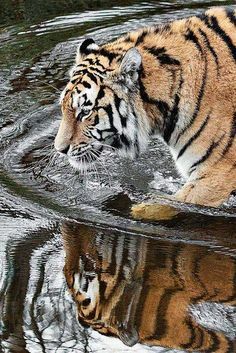 Images like this one of a large cat and its image reflected in a crystal clear pool of water drive our hearts to break over the fact that there are estimated to be fewer than 3,000 tigers left across the globe. 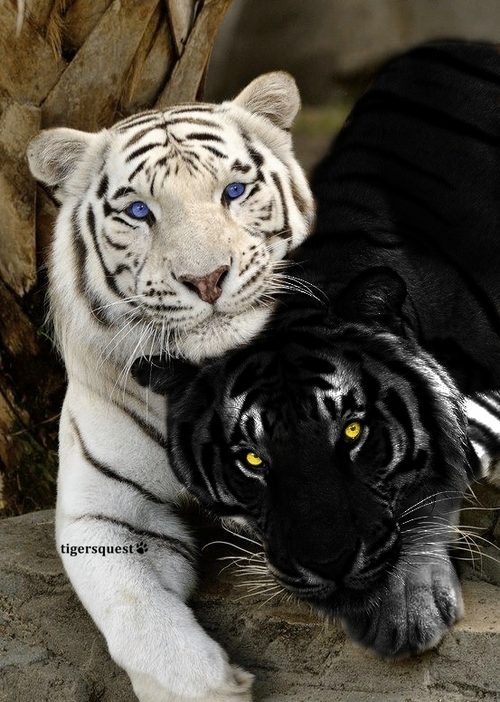 This image of a black and white tiger lovingly intertwined in each other’s arms drives home the notion that diversity in the color of our skin (and their fur!) can be a beautiful thing rather than something to be feared. It’s safe to say that this guy has been brushing and flossing his teeth several times per day. We’re sure he would get a clean bill of health from his dentist! 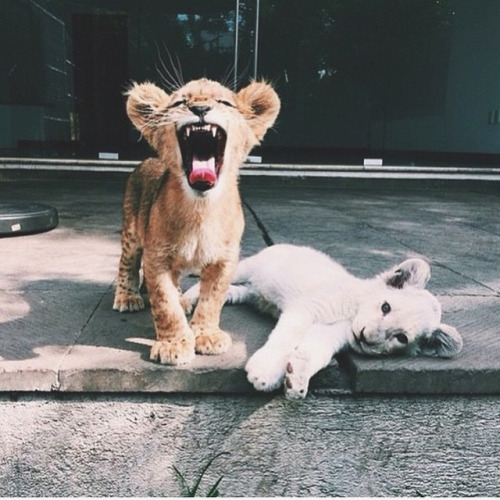 Just like their human counterparts, tigers also display a wide range of emotions, from fierce and ferocious to calm and subdued, as these cute little babes clearly demonstrate. 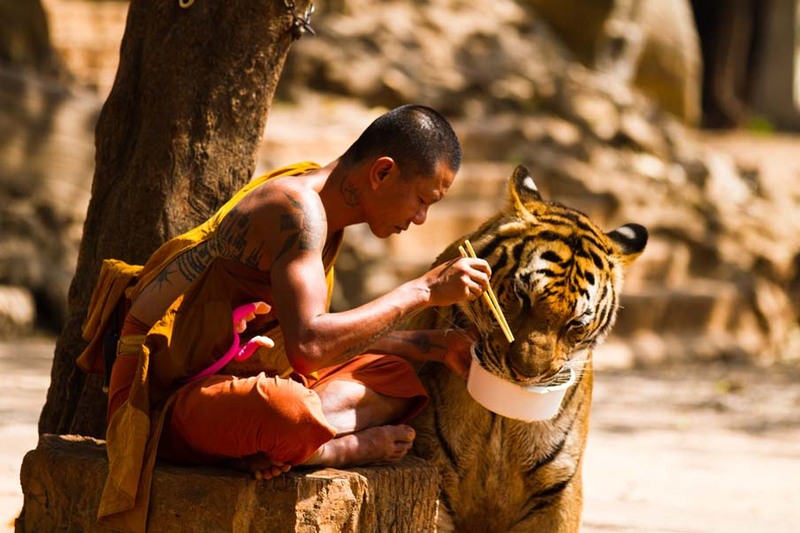 Quite incredible, this photograph of a monk and a tiger warms our hearts and makes us believe that harmony and serenity between species really can be achieved throughout the world if we all give peace a chance. 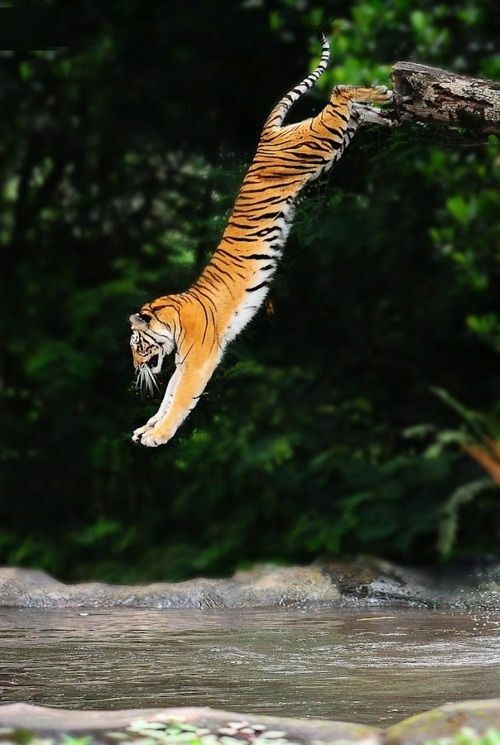 This incredible photograph of a tiger leaping off a cliff into the river below is proof that our idea of fun as humans isn’t that different than that of creatures in the wild. After all, most of us have been to parties at lakes or rivers during which a band of friends decides to dive off a high point into the refreshing water below. 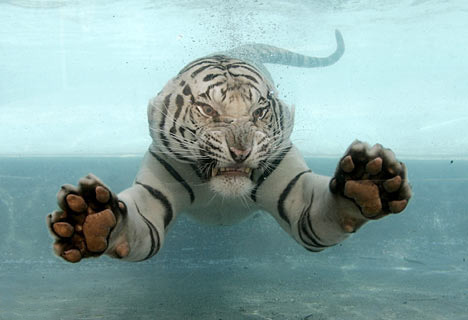 Although it is an indisputably beautiful animal, we definitely wouldn’t want to be trapped beneath the water’s surface with a White Bengal tiger if he had this aggressive expression on his face. 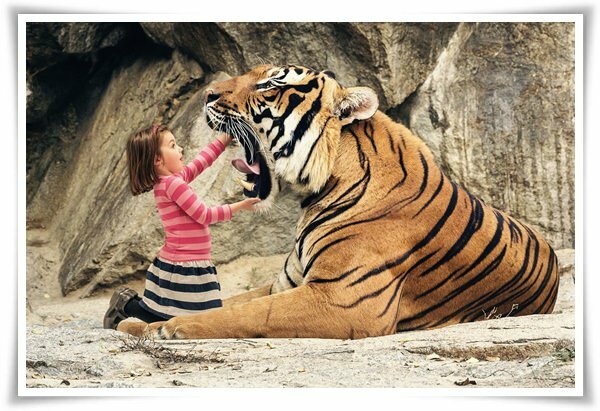 This super sweet tiger cub doesn’t look any less friendly or snuggly than a perfectly tame little kitty from a suburban household! 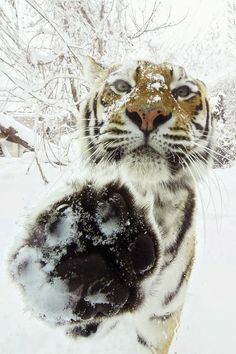 While we’re sure that the person behind the lens of the camera was slightly terrified, we’re thankful for his daring spirit so that we could see this incredible image of a tiger putting his best paw forward on a snowy day! This heartwarming photo of a mama tiger and her babies appears to be perfectly posed, just like a human family portrait would be! Hey, we all have squabbles with family and friends that get a little intense sometimes, right? 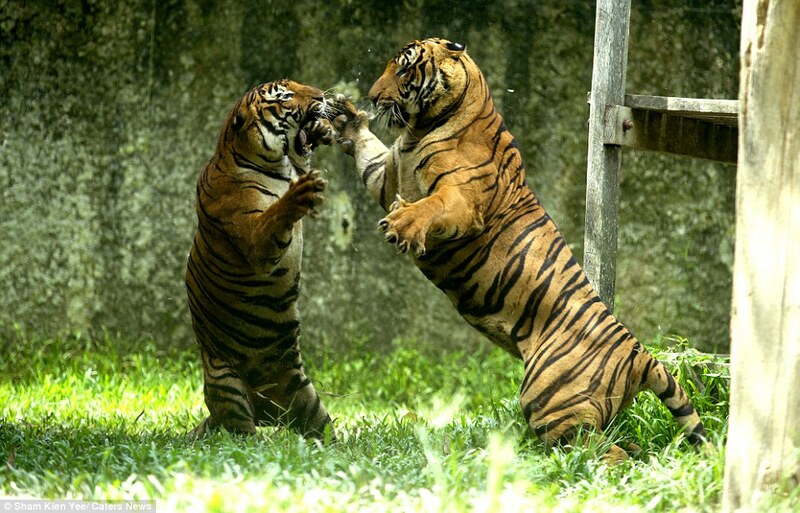 Things aren’t any different for tigers, as this incredible snapshot of a passionate feud between two Malayan tigers clearly illustrates! Any good mama, regardless of species, works hard to ensure that her babies are always fed and freshly bathed. 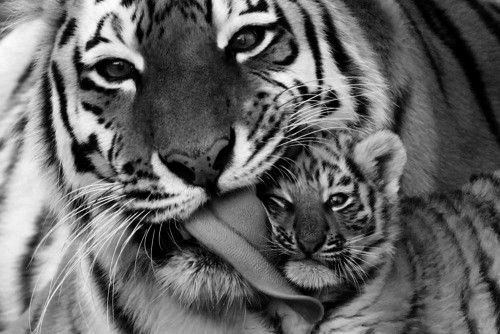 The female tiger in this black and white picture is clearly a doting mommy with an abundance of love and affection for her little one. 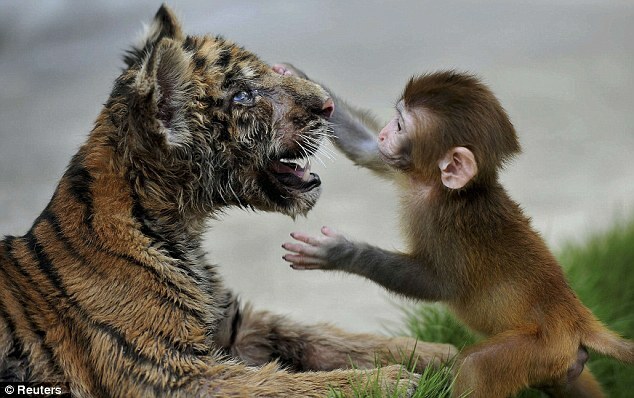 A friendship between a baby monkey and a tiger may seem a little far-fetched, but we promise this picture is not the product of someone with access to photo editing software and too much free time! 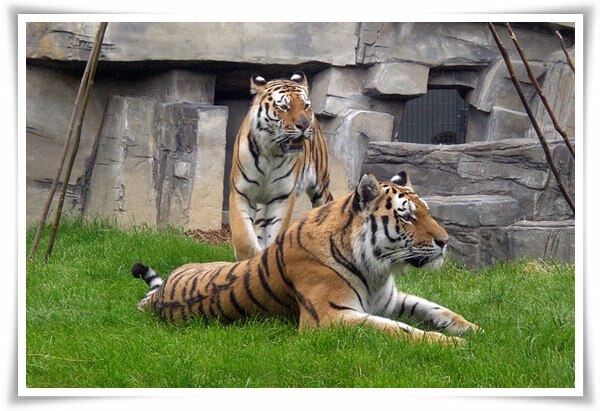 This real-life, interspecies relationship was formed at a Chinese zoo and supposedly lasted for quite some time! 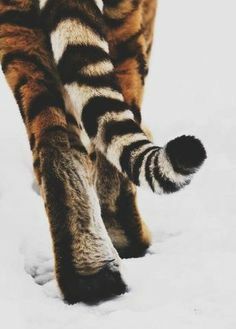 While most photographers choose to make a tiger’s face the focal point of a photo when capturing the wild creature on film, we love how this artist zoomed in on its beautiful tail instead for a unique perspective. 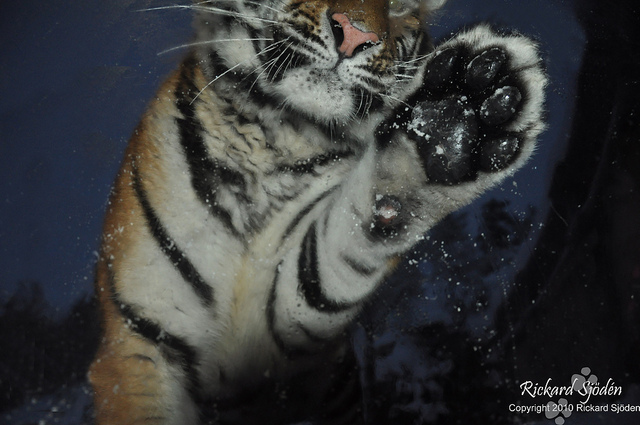 This intimate snapshot captures the velvety texture of a tiger’s fur and the incredible size of its paws. 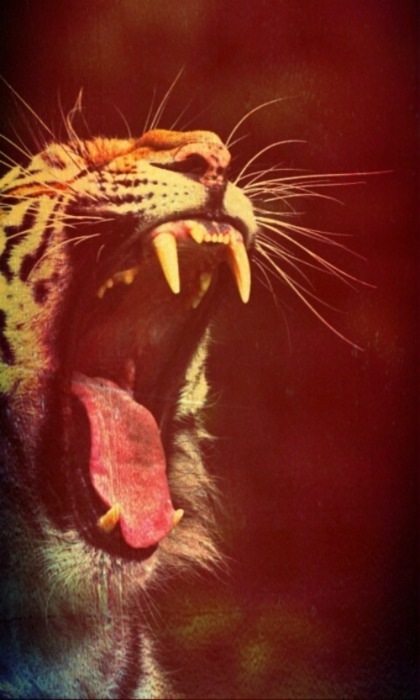 By nature, tigers are lone and solitary creatures and are often found exploring on their own in the wild. 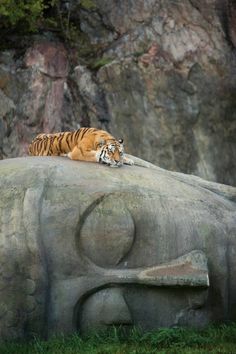 Meditating on an artistic rendition of Buddha, this tiger demonstrates the inter-species importance of alone time when an individual can be at peace with his or her inner thoughts and feelings. There’s no roughhousing in the pool! 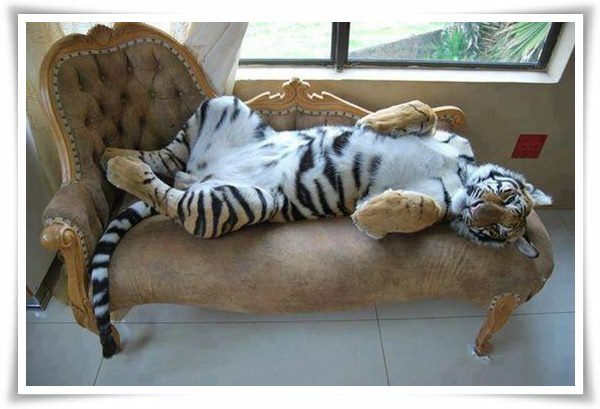 Okay, so maybe human rules can’t always apply to wild creatures, but it was worth a try! 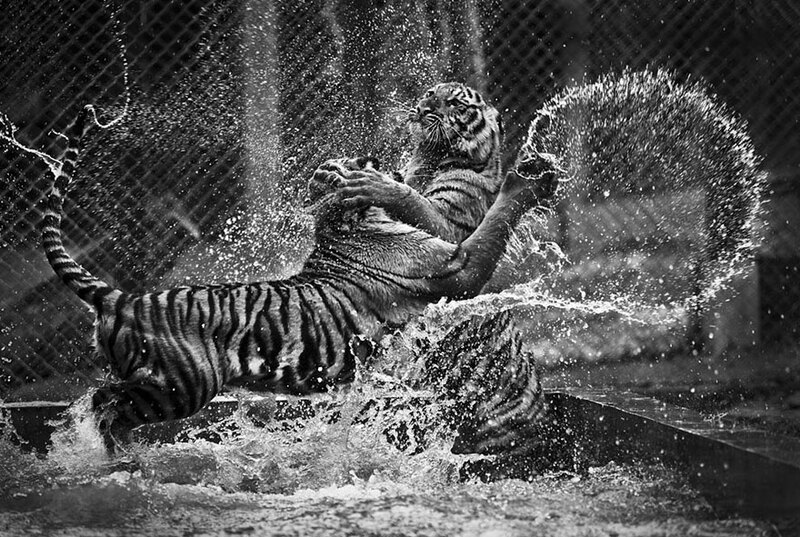 This incredible black and white photograph makes it apparent that some sort of discord was going on between these two big, beautiful cats; we sure wouldn’t want to be caught in the middle of this violent fight! 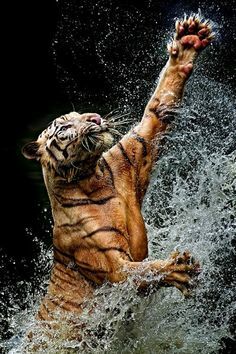 The toned muscles and almost humanlike strength of the tiger in this photograph leaves us feeling awestruck and inferior to its valor. 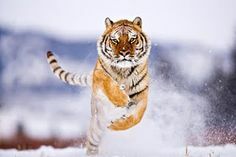 Kicking up powder beneath its monstrous paws, this tiger is a magnificent sight as it races across a snow-covered landscape in the wild. 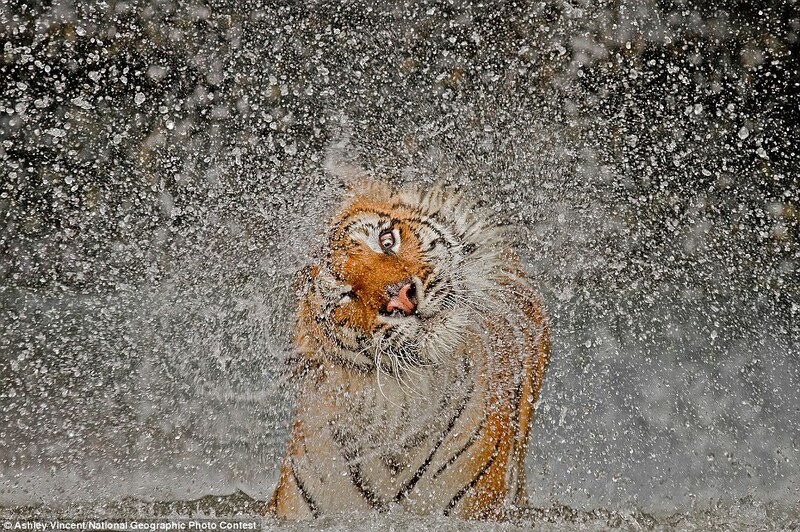 This big guy shaking water off his fur would be a welcomed presence on a hot day, as he would make a dip in the pool or a run through the sprinkler to cool off completely unnecessary for any bystanders. 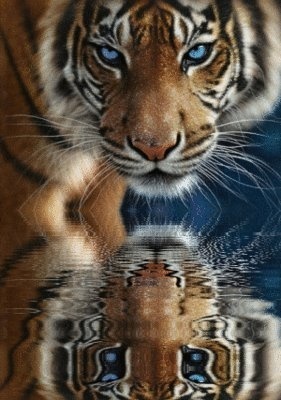 The rippling pool of water in itself would make for an amazing photo, but the inclusion of a grandiose cat viewing its reflection within it makes it almost unbelievable! 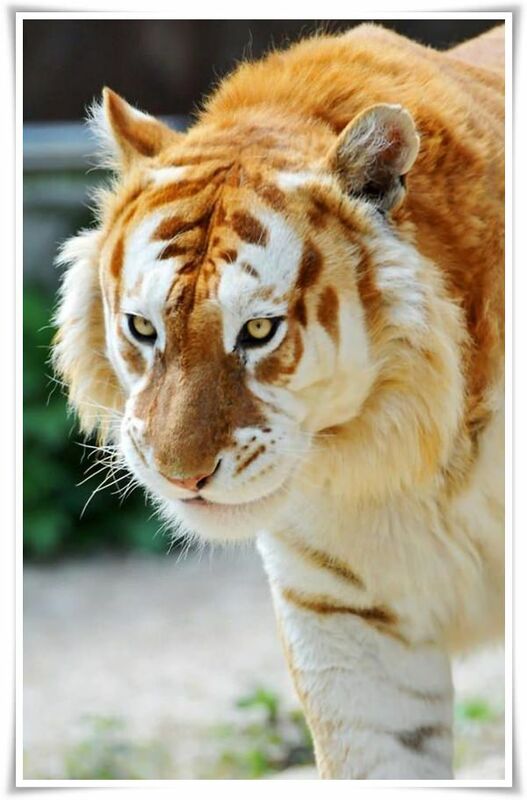 Only thirty Golden Tigers exist in the world, as their coloring is not found in the wild and is instead the result of breeding that occurs in captivity. Regardless, they are still an incredible and stunning sight to behold. 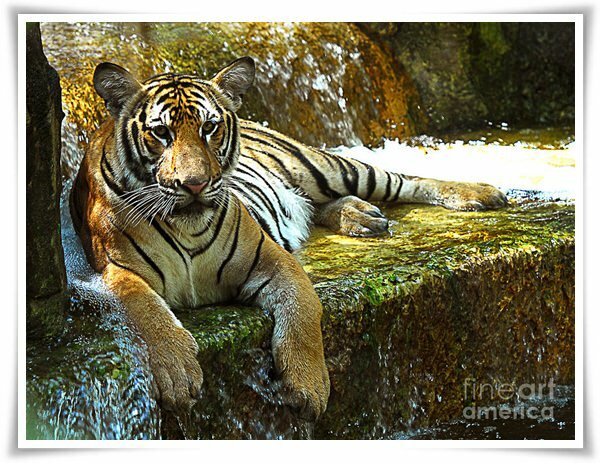 The photographer behind the lens of this mind-blowing picture had to be completely astounded when this tiger began to sink its head into the mossy surface of a shallow pool. 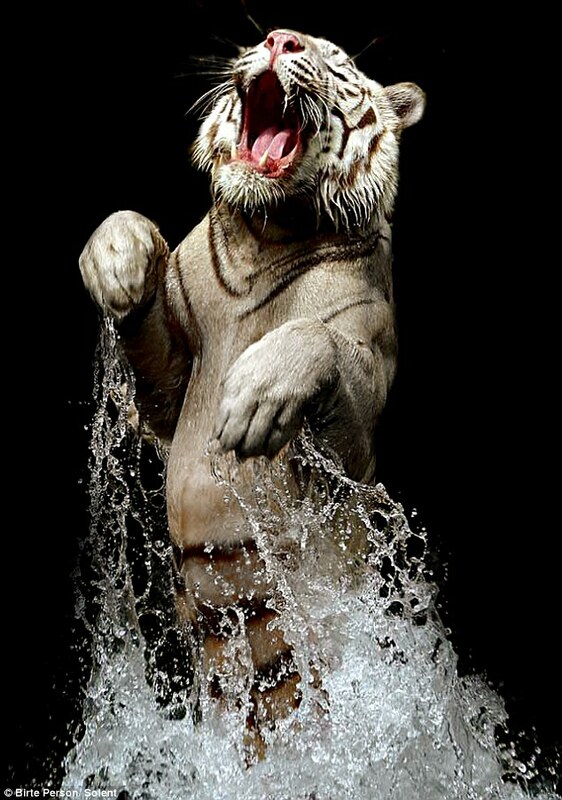 This fabulous photo of a white Bengal tiger was snapped during feeding time at the Singapore Zoo, clearly demonstrating that you can take an animal out of the wild, but you can’t take the wild out of a tiger!